While most Singaporean hoteliers seem to have fled the high-rent belt of Orchard Road for more atmospheric digs in satellite neighbourhoods, the Ascott group of serviced apartments clings to a tried and true business model of offering upmarket accommodation in central locations. Its latest offering, The Ascott Orchard, is a newly minted mixed-use development by local architects RSP, that straddles Orchard Road and tony Cairnhill Road. Of the 220 apartments, it’s the eight penthouses that have us reconsidering our check-in options. 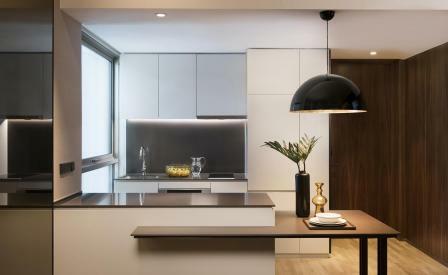 Occupying the 20th floor, the penthouses are offered, unusually, in several permutations – studio units and one- and two-bedroom units – each designed in-house by Kian Liew and Cher Lynn Tan. Even more unusually, each is furnished by Fendi Casa – a subtle wink to the glittering stable of fashion houses for which Orchard Road is justly famed. In addition to the Fendi Casa sofa, rugs, armchairs, dining chairs, tables and lamps, the luxury quotient is amplified by Italian walnut veneer wall panels, oak timber floor, Christofle tableware, bathroom fixtures by Patricia Urquiola for Hansgrohe, and silver mink marble with solid bronze trimmings – all of which makes you wonder just how any of this will look on the company expense claim form.